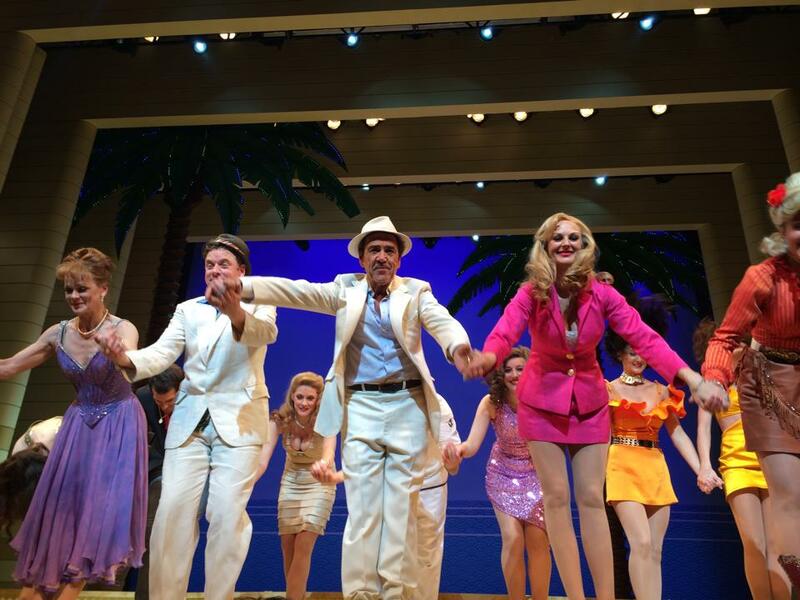 It is unclear quite how Dirty Rotten Scoundrels the Musical has been performing at the Box Office. Some industry gossip suggests sales are solid but not selling out every show. Showbusinessinsights has seen the show twice, with almost full houses both times. Unlike on Broadway, where box office grosses are reported weekly and success (or failure) is very public, West End theatres do not reveal sales – except when occasional ‘record-breaking’ statistics are reported to boost PR. The producers of Scoundrels are giving confident signals. They extended the booking period at the Savoy Theatre to March 2015 fairly soon after opening. They are also refusing to discount ticket prices, whether through TKTS or with 2 for 1 deals. In so doing, they give the impression that Scoundrels is the only show other than Book of Mormon that does not need to discount and is, by implication, one of the hottest tickets in town. In an era when almost every show discounts, this is either a bold bluff or an indication that Scoundrels is indeed selling well. 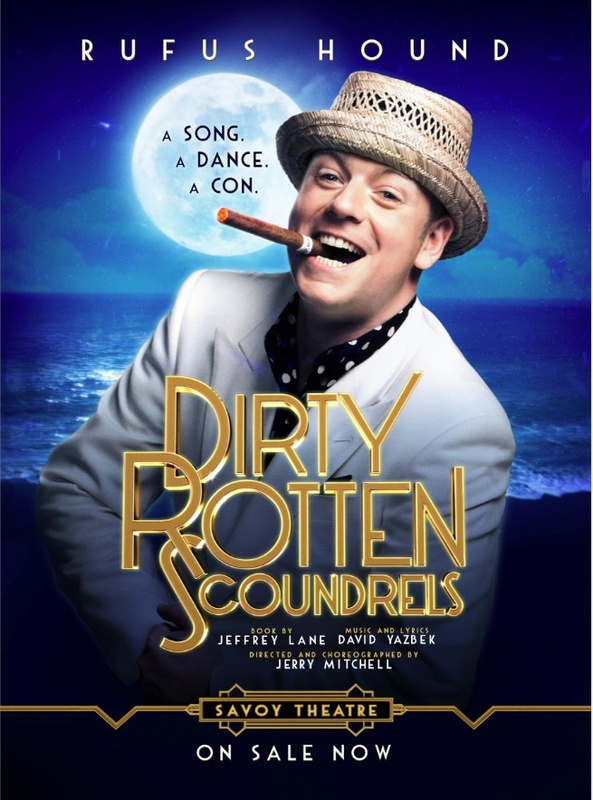 Nonetheless, Dirty Rotten Scoundrels has been on a marketing blitz recently. Firstly, the stars have been out and about on the TV chat circuit, including Loose Women and The One Show. Scoundrels also sought to raise its digital profile by hosting a Digital Press Night, inviting selected bloggers and digital theatre experts to see behind the scenes. The Scoundrels digital marketing team are one of the most effective in the West End with quality Facebook, Twitter and Instagram content and competitions every day. This has has also been followed up with a renewed advertising campaign. The campaign appears to be subtly re-focussing the image of the show. Initially Scoundrels was clearly positioned as a comedy musical. This was clear in the casting: with West End veteran and star of My Family and Citizen Smith Robert Lindsay joined by stand up comedian and TV Panel show regular Rufus Hound. Most big budget West End shows do not take the ‘above the title’ star name approach, but Scoundrels, by naming two high profile comic performers in its advertising was clearly signalling that it is a show with a heavy comic angle. The new advertising campaign, with posters on the Tube and newspaper adverts appears to be positioning the show more as an elegant song and dance show. 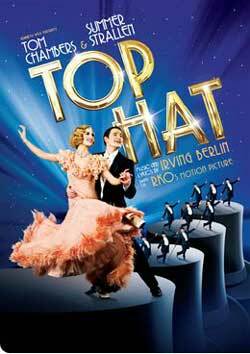 The selected review quotes namecheck Top Hat and Grand Hotel. The photography concentrates on dance poses that support an implication that ‘if you liked Top Hat, you’ll love Scoundrels‘. There is also a higher-profile for Samantha Bond, now featuring solo on selected posters on the Tube. Just in time for the return of Downton Abbey in a few weeks’ time. Downton Abbey: another link to a more elegant age and positioning. Even the graphics echo the Top Hat image. This apparent repositioning is interesting for two reasons. Firstly, it suggests that the producers now believe that there is not quite so strong a market for comic musicals as there is for elegant escapism. If this is the case, then they selected their star name wisely. Robert Lindsay is a luxury signing as he is three things in one: a genuinely great actor (some consider his performance in The Entertainer to be better than even Olivier’s), a mainstream TV comedy performer as well as a very talented dancer, with the elegance of a modern day Fred Astaire. With these three traits, the show can be subtly repositioned by emphasising or de-emphasising one or more. If the marketing angle is now two thirds dancing elegance and one third comic entertainment, what price Anton Du Beke being offered the role of Lawrence if the run is extended? It does raise the question of the strength of the out-an-out musical comedy as a genre in the West End. Other than Book of Mormon, there are very few musicals currently playing in the West End where comedy is the principle characteristic, versus dance, emotion, children’s entertainment or nostalgia. Perhaps there is more box office in Fred Astaire than Steve Martin. The second area of interest is in the plausibility of such a repositioning. The fact is that Scoundrels is a comedy – and a very funny one at that. I suspect that most people come out of the show thinking primarily ‘that was very funny and the songs were fun’ and then ‘Robert Lindsay can’t half dance, 64 years old or not!’. 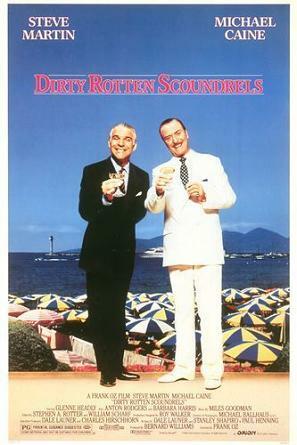 Scoundrels is based on the 1989 movie with Steve Martin and Michael Caine, which was decidedly a comedy and had no hint of being an elegant dance vehicle, given that it was not a musical. 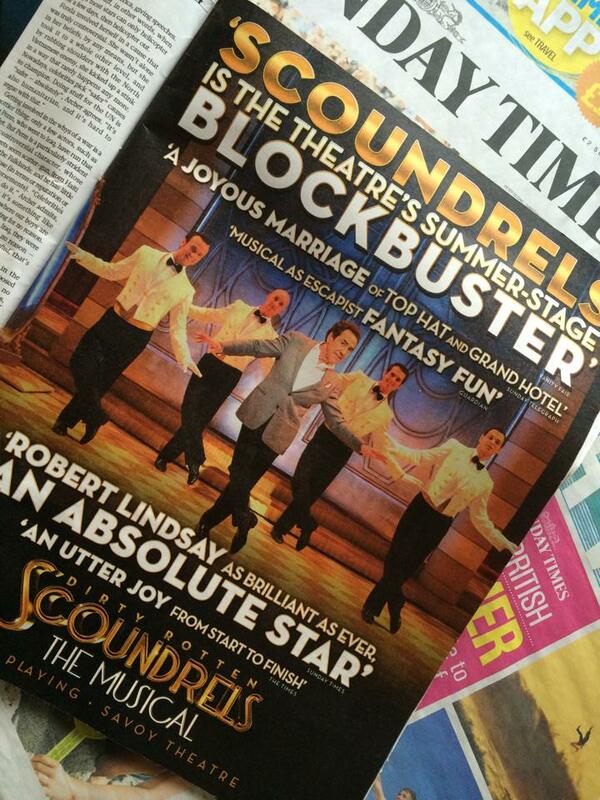 If audiences are sold the promise that Scoundrels is the new Top Hat, will they feel at home with Scoundrels? How will they react to All About Ruprecht, a hilarious song featuring lines including ‘fresh-shaved testicles on Christmas Day’ and ‘KY Jelly on a rubber glove’? And would Ginger Rogers have sung the line ‘You can watch me blow those little f***ers heads clean off’ as Lizzy Connolly does so hilariously? Maybe it doesn’t matter. The West End is a battlefield and with a spate of high-profile flops in recent months, is it so bad if Scoundrels positions itself as an elegant song and dance show and then gives the audiences the bonus of it being a very funny show rather than selling it as a comedy but giving them the bonus of elegant production numbers? It is more interesting to look at the wider implications for West End as a whole. Perhaps audiences want more song-and-dance productions rather than musical comedies. The success of Miss Saigon and the failure of I Can’t Sing would suggest so, but the continued success of Mormon would not. With a raft of new productions circling the West End, perhaps the next few months will give us answers. At any rate, Showbusinessinsights wishes Scoundrels the very best. It’s a very funny and surprisingly uplifting show, with a wonderful cast and I hope it sticks around for a good while. This entry was posted in musicals, Theatre, West End and tagged book of mormon, Dirty Rotten Scoundrels, Downton Abbey, Fred Astaire, Ginger Rogers, Grand Hotel, I can't sing, Lizzie Connolly, miss saigon, Robert Lindsay, Rufus Hound, Samantha Bond, Savoy Theatre, Top Hat, West End by showbusinessinsights. Bookmark the permalink.